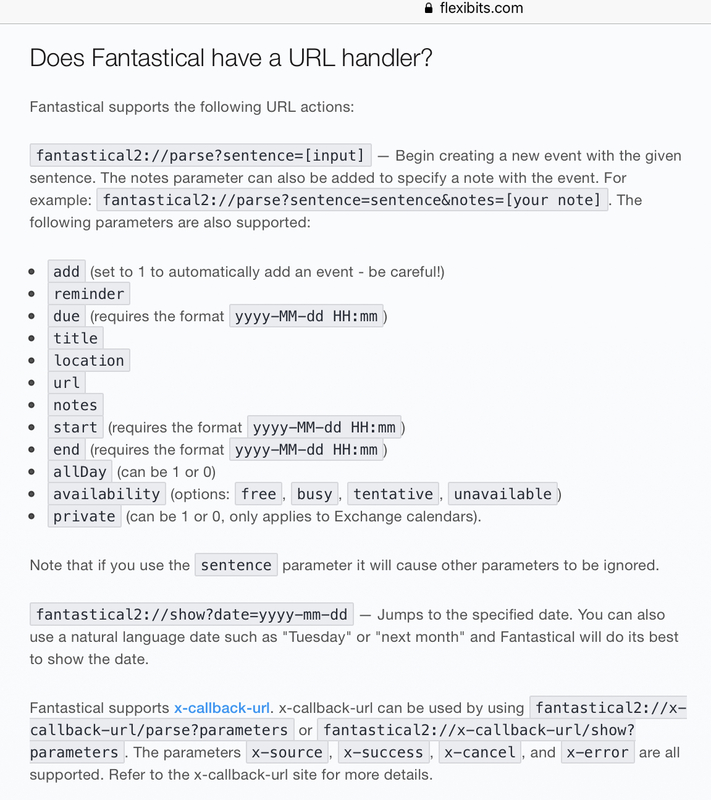 Fantastical is an popular calendar app with excellent natural language parsing capabilities which can be integrated into Drafts in a number of ways. Fantastical can provides an iOS Share extension which can be used with Drafts’ Share action. It also has excellent x-callback-url support to integrate directly with Drafts. Takes the text of the current draft, and sends it to Fantastical to be parseed as a new calendar event. Takes the text of the current draft, and sends it to Fantastical to be parseed as a new reminder. Send each line of a draft to Fantastical as an individual event. This action demonstrates use of scripting to break up a draft and execute individual URL callback tasks on the values. 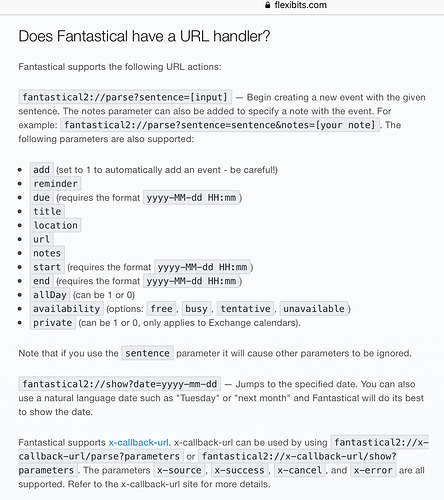 Peter Davison-Reiber’s Fantastically Good Event Parser has similar functionality and natural language event parsing, but does not rely on Fantastical. For some reason, the multiple events action for Fantastical now wants you to confirm each add with the fantastical app as opposed to spring back and forth automatically. This obviously stops it working in the background. Any way to fix ? Modify the script step to include the add parameter with a value of 1 in the URL. The existing Calendars5 action is an url not a script. I tried editing the existing Fantastical script to see if that would work, but while it opens the Calendars5 app, it doesn’t not pass any data. Are just you trying to do this with Fantasticsl as you said originally, or with Calendars5 as you just referenced? See the reply here then. Thanks. That seems to be for single entry however. I am trying to work out multiple entry where it parses each line of my draft as a new entry. Am I missing something ? If you can do it with one line, you can do it with many by looping over the lines in turn and doing the same thing in theory. The only limiting factor would be if Calendars5 is actually only supporting a URL scheme rather than a full x-callback-url scheme; you wouldnt be able to return to Drafts after each parsing - that may be a limitation on the Calendars5 side. My apologies. I now understand the confusion. On my browser its showing all my posts and replies together. I posted two separate topics. One about the fact that Fantastical was wanting user input between each step of the process on multiple event entries, and then another post where I was asking if it were possible to have the same sort of multiple entry action for the Calendars5 app. When I saw your first reply, the way it appeared in my browser was that your reply about Fantastical was referring to calendars5.